Arrive Mumbai International airport. On arrival, the guest will be met by our representative and transferred to hotel. Upon arrival at hotel the guests will be provided with the traditional Indian welcome. Indian welcome consists of Aarti-Tikka and garlands. Morning, one hour boat ride across Mumbai Harbour brings you to the lush green Elephanta Island. Here, visit some of the huge and intricately carved Elephanta Caves that date back to the 8th century. For rows of massive columns cut into solid rock from three magnificent avenues, lead to the outstanding three-headed sculpture representing Brahma the Creator, Vishnu the Preserver and Shiva the Destroyer. Dedicated to Shiva, the beauty and power of these phenomenal sculptures depicting the various manifestations of Shiva is overpowering. Afternoon, City tour of Mumbai - the great port city with its Victorian Gothic buildings from the British Raj Era mingling with the modern. 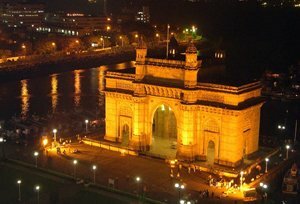 The tour includes 'Gateway of India' overlooking the Harbour, the 'Towers of Silence', 'Marine Drive', the 'Colaba Causeway' - the commercial heart of Mumbai and the Dhobi Ghat, the unique and colourful outdoor 'laundry'. Drive upto the Malabar Hill to the lovely 'Hanging Gardens' and the Kamla Nehru Park from where you will get a wonderful view of Mumbai and the Arabian Sea, spread out before you. Also visit Mani Bhawan, a small museum dedicated to the life and works of Mahatma Gandhi, and the bustling Crawford Market. Morning transfer to the airport to connect flight to Cochin. Upon arrival, meet & transfer to the hotel for lunch. Thereafter drive to Periyar. Upon arrival at Periyar - check into hotel Periyar - Sprawling across 777 sq. kms. 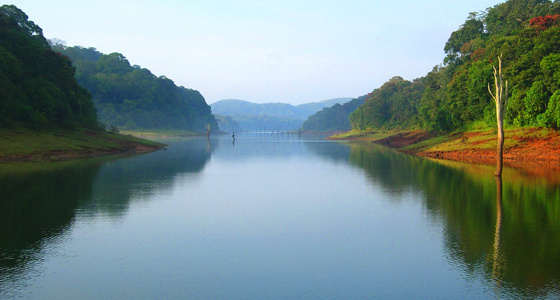 of the Cardamom Hills of the Western Ghats, Thekkady is the home to one of the largest wildlife reserves in India. Alive with exotic flora and vibrant wildlife, it is the perfect getaway tucked away among hills. Spice Village Resort is situated just outside the famous Periyar Wildlife Sanctuary. This unique and deluxe village resort is set in a spice garden - with 37 cottages of thatched roofs which blend well with the surrounding greenery. Early morning boat cruise on the Lake of the famous Periyar wildlife sanctuary to see wild life. Periyar - an artificial lake or reservoir created by a dam on Periyar River is the heart of the Wildlife Sanctuary wild elephants, Asiatic Deer, Black Buck and even Tigers come to shores of the lake for a drink. Return to hotel for breakfast After breakfast a guided walk around the Spice Village to see the various spices grown in the resort garden. Thereafter drive through the winding " Ghats " lined with prosperous tea plantations & then arrive the fascinating countryside of low-lying palms and paddy fields to Kumarakom enroute visit the tea estates. 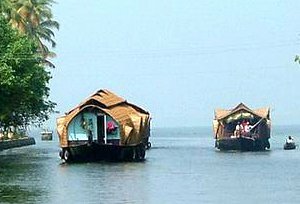 Kumarakom - is a beautiful backwater village on the shores of the enchanting Vembanad Lake, criss crossed with meandering waterways and ancient cottages. A holiday in Coconut Lagoon promises to be different from any other. Every "tarawad" or cottage you stay in is at least a century old, reconstructed piece by piece in accordance with ancient rites of carpentry. Relax at the waterfront, with the occasional native row boat gliding silently by, and the air so calm, you can reach out and touch the sky with your fingertips. Morning at leisure at Coconut Lagoon, taking a cruise on the backwaters in traditional country canoes called "vanjis" to see the agricultural activities of the local people living on the back waters. Visit also the beautiful bird sanctuary. Lunch at the hotel. Afternoon board the traditional rice boats - Kettuvallam and begin your journey through the picturesque backwaters and small lakes relaxing in the tranquillity of Kerala's beautiful scenery. Experience the way of life and activity of the local people, the one bedroom house with a lounge is exclusively for you, meals will be served with freshly bought produce from the local markets and cooked on board. Breakfast on board. Sail to Alleppey & disembark at Puthenangady Jetty. On arrival proceed directly to Mararikulam. Mararikulam - is one of the picturesque fishing villages that dot the lovely coast line of Kerala. 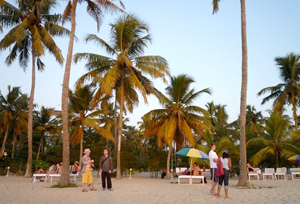 This private, shallow beach is fringed with unending lines of coconut palms. Rest of the day at leisure for own activities and enjoy the facilities of the Resort. Full day at leisure for own activities and enjoy the facilities of the Resort. COCHIN - Popularly known as the Queen of the Arabian Sea, Cochin is the oldest European settlement in India. Frilled with backwaters and rich with old world charm, this city has lured many a great voyager to its shores. Arrive Cochin & check into hotel Tour of Cochin or "Kochi"- the palm green, commercial capital of Kerala is known as the "Queen of the Arabian Sea". From time immemorial, Arabs, Chinese, Dutch, British & Portuguese seafarers followed the sea route to Kochi & left their impression on the town. Modern Kochi is thus a splendid mosaic of these myriad influences. Visit the Dutch Palace, the Jewish Synagogue, the Church of St. Francis, the Bolghatty Palace & the famous Chinese fishing nets. Afternoon, Harbour cruise - Cochin has one of the finest natural harbours. 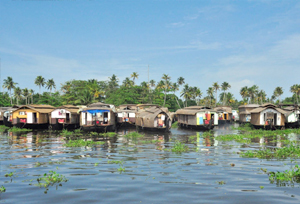 The backwaters extending to the east & south from the harbour are dotted with tiny islands, formed naturally by alluvial deposits from the rivers. Evening witness the Kathakali dance performance and make up demonstration - Kathakali is a unique dance which has a 2000 year old history with more than 100 different 'mudras' or gesture depicting deities, demons, heroes, heroines and kings - each based on episodes from the Mahabharata and Ramayana, the two epic Indian myths. Morning transfer from hotel to the airport for flight to Mumbai. Upon arrival - met & transferred to the hotel where rooms will be provided for wash and change. Rest of the day at leisure for own activities and to enjoy the facilities of the hotel. Later transfer to the International airport for onward flight.